Christianity.com has just released the beta version of their new bible study software, and are confident it is a groundbreaking program. Some of the key aspects of the website are multiple bible translations, personal notes, highlighting verses, and additional commentaries and so on. Looking around the website it has some real similarities with YouVersion, which is also in a Beta stage. 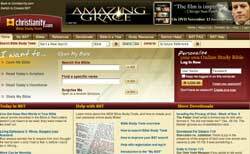 The main advantage Christianity.com seems to have is the volume of bible translations. With 29 available (if you log in) it is very likely it will have the translations you prefer to study with. Whereas YouVersion is much more open in the content it will hold (you can submit your own sermons, and comments) it looks as though Christianity.com will be much more tightly controlled. Whether or not this is good will no doubt depend on both what you would prefer, and just how well YouVersion manages to achieve its goals. I found it a little slow to use, but my broadband is a bit like a snail at the moment so it may have just been me! It was easy to navigate the various options and to sign up for an account. They are interested in people testing it whilst it is in the beta stage to find any mistakes, so if you want to help then sign up now. Whether or not the new Christianity.com bible study tool is groundbreaking is open to debate. However I have no doubt that once it is out of the beta stage it will help many Christians in their walk with God. When the tool is fully running I will provide a more detailed review. This past week, we have taken the private beta version of our new Bible Study tools live on Christianity.com. at http://bible.christianity.com. Bible Study Tools is a groundbreaking new interactive way of studying the Bible online. We invite you to explore fearlessly! Kick the tires – dive in and take a look around! And let us know what you think. Then Bible Study Tools is for YOU! We are praying that you will continue to grow profoundly in the knowledge and understanding of Christ.